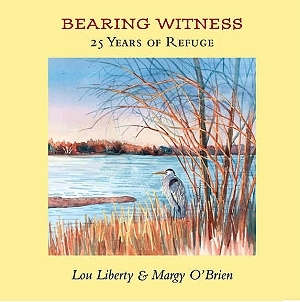 Bearing Witness: 25 Years of Refuge is a delightful collaboration between North Valley artist Margie O'Brien and local writer and teacher Lou Liberty. Bearing Witness has 68 pages of art, poetry and prose and a foreword by VB Price. It sells for $30; a limited edition is available for $50. It's just been released in time for the Rio Grande Nature Center's 25th Anniversary, and will debut with a book signing Saturday Nov. 10 at the Rio Grande Nature Center State Park at 6:00 p.m.
Seventeen of the original watercolors will be on sale at the Nature Center through Dec. 1. This is sure to stir your heart strings, if you're at all called to the outdoors, right in our backyard, as I am. Nov. 27 at Page One at 7pm.